All the talk of Sudden Infant Death Syndrome (SIDS) these days can leave parents feeling paranoid when bedtime comes around. Aside from following the AAP’s safe sleep guidelines, one thing parents can do to get some rest at night is purchase a baby sleep monitor. There are many different baby monitors available for you to choose from, including audio, video, movement, and breathing monitors. The best baby sleep monitors are the ones that alert you if your baby needs you but won’t keep you up all night with needless lights, sounds, and false alarms. Infant Optics’ DXR-8 video baby monitor has an interchangeable optical lens that makes it easy to change the camera angle and zoom in to see your little one sleeping peacefully. Invisible IR night vision lets you see clearly in the dark without waking your baby. This video monitor has won several awards, including Popular Mechanics Best Baby Monitor in 2018. Designed to be completely private, this monitor has its own receiver with a 3.5-inch screen. Since no wi-fi or smartphone is needed, this monitor is hacker safe. It also means you get instant playback ̶ no connection issues or waiting for apps to load. The range for this monitor is 700 feet with no obstruction. Some other features include a sound activated LED bar, two-way talk, and a remote thermometer. UU Infant’s digital video baby monitor uses a secure independent frequency to ensure a safe connection that doesn’t require wi-fi. The receiver unit has a 3.5-inch LCD screen and a long list of capabilities, from two-way talk and playing lullabies to temperature monitoring and IR night vision. A few things that make this video monitor special are its long transmitting distance and the fact that it has an alarm clock. Parents can set alarms to feed their baby, give medicine, etc., which is something that some baby monitors don’t have. This video monitor’s camera is mountable and can be manually rotated horizontally by 180 degrees and vertically by 120 degrees. Parents can zoom 2x to get a closer look at their baby or turn on power save mode to take advantage of audio-only and minimize light from the screen if it keeps them up. Sometimes loses signal around kitchen appliances/routers/etc. ANMEATE’s video baby monitor has a digital camera that also features a temperature monitor so parents can always tell if it is too hot or cold in their baby’s room. This monitor comes with all the expected features, including two-way talk and automatic night vision. The wireless parent unit has a 2.4-inch color LED screen with 2x zooming capabilities. This unit lets you live stream from your baby’s room and react in real time by playing lullabies or talking to sooth your baby. This monitor is easy to install and has a long transmission range of 960 feet. Parents like this baby sleep monitor because it comes with a three-month money back guarantee. The smaller screen on the parental unit makes this monitor extra portable without compromising screen quality. The unit alarms when out of range or low battery (battery lasts about 8 hours in ECO mode). Best for: Video Clarity Snuza’s Hero Baby Monitor is a wearable device that clips to your baby’s diaper for added reassurance while baby sleeps. The great thing is that there are no cords or wires that baby can get tangled in, just sensor pads and the diaper clip. A faint clicking sound indicates that the device is on and working. After 15 seconds without stomach movement, the device provides vibration stimulus. After 20 seconds without movement, an alarm rings. The device also alerts if movements are weak or there are less than eight movements per minute. One thing to remember is that this device is sensitive and picks up external movement. Therefore, the Snuza should not be used when co-sleeping, nor in a car seat or stroller. Aside from those exceptions, this monitor is very portable which is another advantage over mounted camera monitors. BAIESHUI’s video baby monitor is easy to set up and doesn’t use wi-fi, which means parents don’t need to worry about lagging or privacy issues. This monitor’s parent unit has a large, 3.5-inch LCD screen with night vision, temperature monitoring, two-way audio, and more. This monitor is great because of its long battery life (ten hours) and eco-mode feature that allows you to turn off the screen and have it automatically turned on when sound is detected. Some other features that parents love are the alarm clock, 2x zoom, and lullabies that can be played remotely. Customers like that this video monitor is long range with clear video. There’s a voice prompt warning if the monitor loses connection or if the battery gets low, so you always have an eye on your little one. 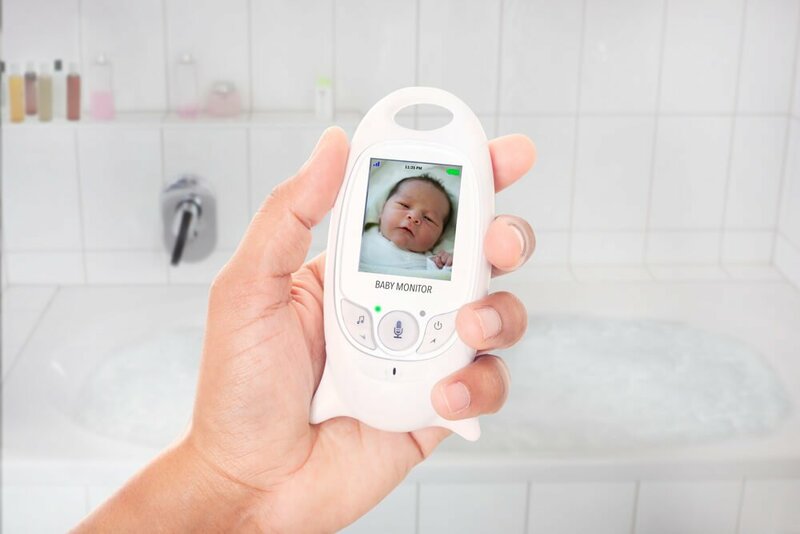 The Babebay video baby monitor has a lot of the features that parents have come to expect from such a monitor, including two-way talk, night vision, built-in lullabies, a temperature sensor, alarm, and eco mode to save battery. The monitor’s 2.4-inch color screen shows your baby in real time; no lagging, privacy or internet connectivity issues. Easy to setup and long range, this monitor can be mounted to a wall or table top and can be rotated manually. Babebay’s parent unit is very portable (small enough to fit in your pocket as you walk around the house!) and offers multiple views of your little one as they sleep. Like other monitors that operate without apps or an internet connection, parents can expect a private and secure connection. The Philips AVENT SCD570/10 DECT baby monitor offers parents a secure, private connection with zero interference from other transmitting products, including cell phones and other baby monitors. This means no matter what devices are around your house, your monitor always stays connected. This monitor may be audio only, but you can expect that the sound will be clearer than most baby monitors. The range for this monitor is also far, at 900 feet. Some other features of this monitor are two-way talk, a nightlight, lullabies, temperature monitoring. The parent unit for this monitor comes with a docking station so parents can let it re-charge when needed. Philips’ baby monitor has a vibration alert and sound activated lights in addition to audio to let you know when your baby may need you. Finding the right baby sleep monitor for your needs can seem like a daunting task. There are so many different kinds, but they all have a lot of the same features, so how can you tell which one is best? It all starts with knowing what you want and getting familiar with the options that are available to you. There are several different types of baby monitors. Deciding which one is best for you will depend on your needs and personal preference. The four main types of monitors currently available to parents for at-home use are audio, video, movement, and breathing monitors. Many parents will be familiar with audio baby monitors, because ‘back in the day’ that was all there was. These monitors are nice because they allow you to listen in on your baby from another room, so you know if they’re sleeping restlessly or have woken up. Audio monitors are great for parents of healthy babies. These monitors allow parents to go out of earshot of their babies without worrying about them crying and not being heard. If you’re on a budget and don’t mind not having a visual of your baby while they sleep, audio monitors are a good choice. Video baby monitors are newer but have still been around long enough that they’re standardized now. A lot of video baby monitors have the same features, with the newer ones being connected to smartphone apps. Those tend to be a little less safe, but more on that later. Baby monitors with a video screen are great for parents who want more reassurance that their baby is okay, even when they aren’t necessarily making noise. Most video baby monitors come with night vision, so you can see your baby clearly no matter the time of day. Movement monitors are a little bit newer in the world of baby sleep monitors. These monitors often use sensor pads or small devices to monitor baby’s movement throughout the night. If movements are too weak or far apart, the parents are notified via an alarm to check on their baby. These types of monitors were designed for healthy babies, but many parents of premature babies or babies with conditions like sleep apnea rely on them monitors for safety and peace of mind. Since these monitors are sensitive to movement, they don’t work for parents and babies who co-sleep. Audio and video monitors provide some information about your baby, but you can’t always tell from looking at a video if your baby is still breathing. This uncertainty has many parents buying more high-tech monitors rather than constantly getting up to check on their and risk waking them up. There are now baby monitors that track your baby’s breathing and other vitals. These monitors can keep track of important things like temperature, humidity, and whether baby is sleeping on their stomach. One thing to remember about these types of baby sleep monitors is that they’re not FDA regulated. One study conducted by Bonafide et al. (2018) measured the accuracy of pulse oximetry-based consumer baby monitors using an FDA-approved oximeter as a reference. This study looked at the Owlet Smart Sock 2 and Baby Vida, using 0-6-month old babies hospitalized in general pediatrics and cardiology wards as subjects. The study found that these monitors performed inconsistently, sometimes giving off falsely low readings and at other times not picking up on unhealthy vitals at all. Researchers suggested exercising caution when incorporating information from these devices into medical decisions. Kurt Workman, Owlet’s co-founder and CEO, publicly rebutted this study, explaining that their product was designed for in-home use with healthy babies (unlike the babies in the study). Workman also stated that their product has been verified by independent laboratories as performing within international standards for pulse-oximetry. These sleep monitors may give parents who are worried about SIDS extra peace of mind, BUT these monitors are not medical devices. They cannot prevent SIDS and should not be used in place of proper supervision while your baby sleeps. For the most part, a lot of baby monitors have the same features. These are features that parents find useful and have come to expect. When you’re looking to purchase a baby monitor, it’s a good idea to create a little checklist of must-have features that you can’t live without. These are just some of the main features that parents want to consider when looking into purchasing a baby sleep monitor. When it comes to more high-tech monitors (like movement and breathing monitors), you also want to make sure that they’re reliable, measure what they’re supposed to measure, and don’t give false readings. In this age of the Internet of Things, being able to watch your baby sleep from your smartphone (which you always carry with you anyway), might sound like a luxury. Unfortunately, not all baby sleep monitors are created equally, and not all of them are 100% safe. There are all kinds of people who prey on weaknesses in IoT devices, and even though it’s hard to believe, baby video monitors sometimes do get hacked. Since some monitors store video and audio content online, the potential for security breaches means that footage of your children could be leaked or misused. HACKING IoT: A Case Study on Baby Monitor Exposures and Vulnerabilities looks at vulnerabilities in baby monitors from the standpoint that many parents now work from home and may have sensitive information on their devices. Hackers can use certain types of baby monitors (which are often made and shipped with known vulnerabilities) as an easy way to access the rest of a home’s network. Another interesting point this case study makes is that IoT companies usually don’t have a procedure for handling these types of vulnerabilities. When reporting their findings to the companies of devices researched in the study, some did not respond at all and others were suspicious of the objectives of the research. Only one company had a procedure in place to handle product vulnerability reports. Choosing the right video monitor with a secure connection is a must to ensure that you and your family are protected. Monitors that don’t require wi-fi are the most affordable secure option. If you want more privacy, DECT monitors are guaranteed to have no interference with other devices or signals. Baby monitors are a great way to keep and ear and/or eye on your baby while they are asleep. This gives parents the power to get more done or rest while their baby sleeps without constantly going in to check on them. The most common types of baby monitors are audio, video, movement, and breathing. Even though baby monitors are useful, parents should keep in mind that they are not medical devices and cannot protect babies from SIDS. It’s still important to follow safe sleep guidelines and use common sense when you are using a baby sleep monitor. Choosing a sleep monitor has everything to do with your needs and personal preference. Some parents may go with a sleep monitor that has a good overall rating, while others may take more time to find one that’s known for specific features like high security, great battery life, or long transmitting range.